I always knew of the Horrible Harry books, since they were around when I was little, but Horrid Henry was new to me when I became a librarian. Given the strong similarity between the characters’ names and temperaments, I had to wonder - are these the same story? Or is there something unique about each one that sets it apart? Here is what I discovered after reading the first volume in each series, Horrible Harry in Room 2B by Suzy Kline, and Horrid Henry by Francesca Simon. 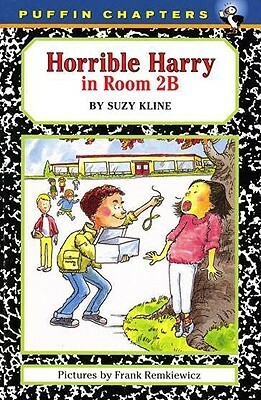 Horrible Harry in Room 2B is narrated by a classmate of Harry’s, revealed after the first chapter to be his best friend, Doug. Though Harry does terrible things - dangling snakes in the face of his crush, Song Lee, threatening his classmates with scary costumes, and creating Stub People out of garbage in his desk that he swears will “bring doom to our room” - the story doesn’t demonize him. Filtered through Doug, Harry appears as an interesting kid, who is definitely a troublemaker, but who is also a real, fully developed human being. His feelings can be hurt, as they are in situations where a classmate calls him Harry the Canary, or Doug chooses someone else as a field trip bus buddy. And in the end of the story, we see Harry actually being nice, in a moment Doug identifies as one of those occasional times when Harry isn’t so horrible after all. Horrid Henry, on the other hand, doesn’t have quite the same tenderness as Horrible Harry in Room 2B. Though we begin in a chapter where Henry is not acting horridly, his behavior is motivated solely by the desire to knock his little brother, Perfect Peter off his pedestal. Once that is achieved, Henry returns to his usual horrid ways. Overall, though both books have their strengths, I think Horrible Harry in Room 2B is the better story, and Horrible Harry the better written - and more sympathetic - character. But I'd recommend both, and think each series would be equally appealing to boys or girls.